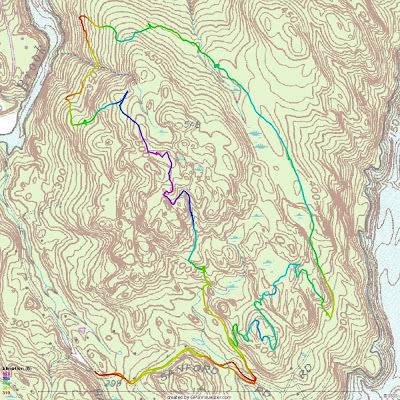 Here is a map of my ride from last weekend. 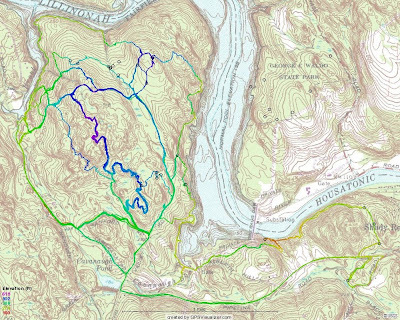 Anyone familiar with the Upper Gussy Trail will see that I cut out a section to check out some other neighoring trails. I climbed up the Gussy from Sanford road, rode down the ROW, over the Wet Spot and instead of heading down into the valley of the two water crossings I tried an old trail I found years ago that seemed be cut out of the rocks when I imagine the Housatonic River was much higher thousands of years ago. I heard some sawing in the distant when I finally hit the forest road. There were fresh truck tracks, too, and in the area where I noticed all the trees were marked there was a logger felling trees. He was pretty well dressed for the occasion, as far as logging goes, as I now now. Doesn't look like I'll be riding any of those logs anytime soon. I saw the skidder off in the back and below is route they are using within that tract of land. I was impressed that their impact was being carefully minimized, unlike what I have seen in the past at Naugatuck State Forest. While I was still feeling adventurous I followed the white trail till it split off towards Kissing Oak but kept heading north. I found a nice little two step roller that I took some video on. From there I tried to follow where the old logging road went but I lost it after the rollers. I think it goes through the nearby break in the stone wall and then parallels that still you hit the stream, which is where I picked it up again. In the photo below you can just make out the depression in the soild where the road tracks. Here is closer view of the same track. It was pretty easy to follow but it's not rideable. At one point I hit a thicket in which I had to walk around which lead me up a steep incline and I came across the skidder path that made part of the Mulikin Trail. I headed west on this path, which I was able to ride for the most part and eventually hit the Mulikin Trail where comes down the hill and does a sharp turn onto the old farming road. Of course the only way I am going to do this kind of exploring is on a singlespeed. I am not going to risk a busted hanger or my rear derailluer getting caught in my spokes. I took hooked back around to the Forest Road and climbed back up towards the Gussy. Guess I am out of shape because I only made it half way up the steep climb. The Gussy was looking nice. I had a little woops on the Log Ride Short. As soon as my front tire hit the log it slipped out from under me and I landed on my back on the benched edge of the trail. My camel cushioned the blow. I think I will wait till things dry out some more before attempting that stunt again. I found a point on the Gussy trail that comes very close to the West Side Equestrian Trail so I decided to check it out a possible bail out. The two trails are probably 30 yards apart. Near the stream crossing is a mud wallow that needs some work that I tried to skirt the edge of it but stalled out and went down like a sack of potatoes right into the wallow. I noticed that somebody did some armoring of the stream but could have done it better. Might have to fix it this summer when the stream is just a trickle.